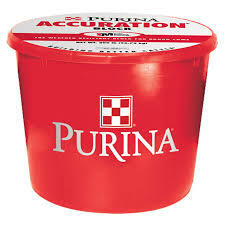 Pick up Purina Accuration Hi Fat Tub at Farmers Coop. Purina Accuration Hi-Fat Block Supplement Feed is designed for cattle, sheep, and goats on pasture. Purina Accuration Hi Fat Tub is a premium, weather-resistant, protein supplement with Intake Modifying Technology®, formulated with a higher level of fat that is designed to provide additional energy to balance nutrient deficiencies in forages for cattle on poor quality forage or lacking energy in their diet. This entry was posted on Thursday, September 27th, 2018 at 4:56 pm	and is filed under Cattle. You can follow any responses to this entry through the RSS 2.0 feed. Both comments and pings are currently closed.